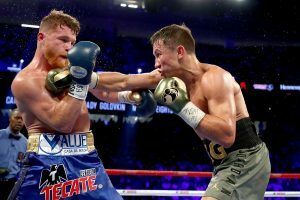 The world’s two top middleweights, Canelo Alvarez and Gennady “GGG” Golovkin, return to the T-Mobile Arena in Las Vegas on Sept. 15 for a highly anticipated rematch, broadcast live on HBO PPV and in more than 450 movie theaters through Fathom’s Digital Broadcast Network (DBN). The action will be fast and furious, which is what will make the event’s audio spectacular, according to A1 Randy Flick. Flick, who heads a crew of nine audio technicians, has a lot of audio sources to choose from. Ambience and ring action will be picked up by Sennheiser MKH 816 shotgun microphones on fish poles in the hot corners and Sennheiser 416 shotguns placed in the neutral corners and facing inward. The boxers’ trainers will be miked for the bout, wearing lavs from Shure’s Axient wireless system provided by Bexel, which is managing the event’s wireless systems. Last September’s match between Canelo Alvarez and Gennady Golovkin was ruled a draw. Overhead, an IMT Dragonfly cable-mounted camera will flit between corners and the center of the ring. There was potentially a traffic conflict with the overhead Audio-Technica BP4027 long stereo shotgun mic, so the overhead mic will be attached to a remotely controlled servo-motored reel that takes it out of the aerial camera’s path between rounds and brings it back in to pick up the fight action. Besides the trainers and the fighters, viewers will also hear translators putting any Spanish or Russian (Ukrainian Golovkin’s native tongue) spoken in the corners into English in real time. Flick, who’ll be mixing on a Calrec Sigma console with Bluefin in NEP’s SS17 truck, says he’ll ride the audio between those in the corners and the translators carefully, letting viewers who speak those languages hear them enough of them to follow but keeping the English translations front and center. The PPV show is mixed in stereo. However, the ambient-sound elements will be used to create a 5.1 surround mix for the rebroadcast a week later on HBO. That remix will be done with a Linear Acoustic/Telos Alliance UpMax v4 Surroundfield controller. Another device, the Dugan automixer, provides its own special assistance for the PPV show. As the matches grow bigger and louder in the venue, ambient-sound leakage into the five announcers’ Sennheiser HME-26 headsets and five Sennheiser MD-46 stick mics can threaten the broadcast-audio balance. Flick says the automixer automatically manages those channels without the choppiness typical of a noise gate and can do so for multiple sources without excessive noise pickup.